SYDNEY—Bollywood dancer Jyoti Dixit had words and emotions spilling over as she relived her experience of Shen Yun Performing Arts on Saturday night Feb 7, at the Capitol Theatre in Sydney. Ms. Dixit has been to a Shen Yun performance six times, and each year she gains new insight. Saturday night was no exception. Ms. Dixit was impressed by Shen Yun’s ability to blend old and new, using technology to bring to life ancient culture. Shen Yun’s digitally animated backdrop creates the effect that the stage performers fly to celestial realms and back to earth. Through experiencing Shen Yun, Ms. Dixit was inspired to return to dancing. “There was a horrendous time I was going through, and I kept on coming to Shen Yun. Last year as well, I had a bad accident, but nothing stopped me from coming to Shen Yun this year,” she said. Shen Yun stages mainly classical Chinese dance, as well as some folk dances from China’s diverse ethnicities. A state-of-the-art digital backdrop, vivid costumes, and music soloists round out the presentation. Among theatregoers also enjoying the performance on Saturday night was artist Conrie Jessup. “It’s wonderful. It’s so energetic, it’s visually stunning and I loved the costumes especially, and the music,” was how artist Conrie Jessup described her Shen Yun experience. With advanced computer graphics technology, Shen Yun’s skilled team crafts brightly colored animated background scenes for each dance piece, creating vivid worlds that give context to the dance. Ms. Jessup loved the way the characters became live on stage. “It adds a really wonderful dimension to the performances,” she said. 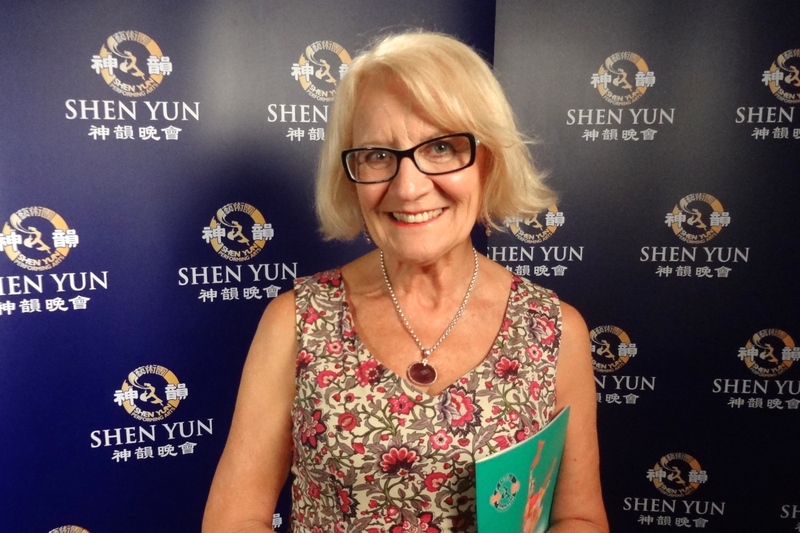 Margaret Standen, a marriage celebrant, was amazed at the performance, and found Shen Yun to be an uplifting experience. Chinese dance is at the heart of what Shen Yun does. Known for its incredible flips and spins, and its gentle elegance, it is one of the most rigorous and expressive art forms in the world, the Shen Yun website explains. She was intrigued by the classical Chinese dances, “It’s just very magical,” she said.